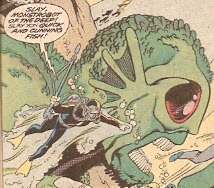 Slay, Monstrobot of the Deep!! : The One Thing Worse Than An Alien Invasion!! Arctic explorers have discovered a massive creature entombed in the ice!! Meanwhile, 1/4 mile away, Captain America is screaming, "Over here, chuckleheads!!" And just as "of course," that defrosts the beastie! But "Oog" can defend himself! Naturally, the bigwigs up their game! Hewy, Oog, maybe pass that "we will never invade you" on to the Badoon, the Skrulls, the Kree. etc...? Now get your asses back up to the Arctic and free Steve Rogers! !